I loved the old bridge, don’t get me wrong. Going across that puppy was a rite of passage when you got your driver’s license. Having said that, the new bridge is beautiful. 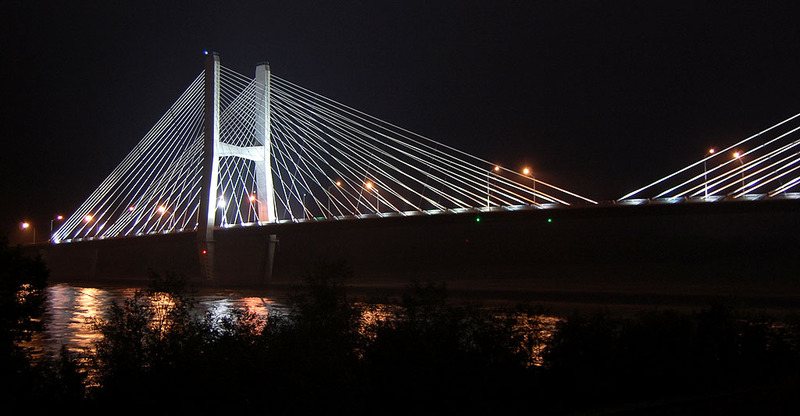 I’ll post more stuff when I can get home and find my pix of the old bridge, but here are some shots of the Bill Emerson Memorial Bridge at night. For any photo geeks, the picture was taken with a Nikon D-40 DSLR using an ISO of 200 and an exposure of 5 seconds at f/6.3. There was a barge working its way upstream (note the light streaks) and I was hoping he would shine his spotlight my way to make an interesting light streak. He was, however, more intent on finding channel markers along the east bank than improving my picture. Click on the image to bring up a larger version. These two pictures were shot at about the same time. The only real difference is that I zoomed out to get both spans in the second picture. I was hoping to pick up some light streaks from vehicles on the bridge, but traffic was light and there was a cold drizzle tricking down my neck. My working philosophy dictated that I wasn’t required to go hungry, get wet or lift heavy objects. Why would I want to work any harder to produce a blog? I was too lazy to set up the tripod for this picture, so I hand-held it at at about one second. That’s why the guy is a little blurry from movement. This is far from the final look of this site. The WordPress template that Son Matt picked is different than the one used by my other blog, PalmBeachBikeTours.com, and there’s a pretty steep learning curve associated with dealing with a graphics-heavy one like this. My old earth science teacher, Ernie Chiles, and I are going for a bicycle ride Wednesday. Thursday I’m going over to the old Central High School to see what it looks like after being converted to a junior high school. Absolutely beautiful, Ken. Those of us who are living away from Cape really appreciate the views. It’s hard NOT to get a good picture of the new bridge. It looks good from all angles. I spent the afternoon walking around on Main Street shooting stuff of the businesses there. It’s hard to find many stores from our era left. I think Lang’s and Zickfield’s jewelry stores are the only ones still around. Your photos are always the BEST! The photos shoots of the new bridge are amazingly grand. 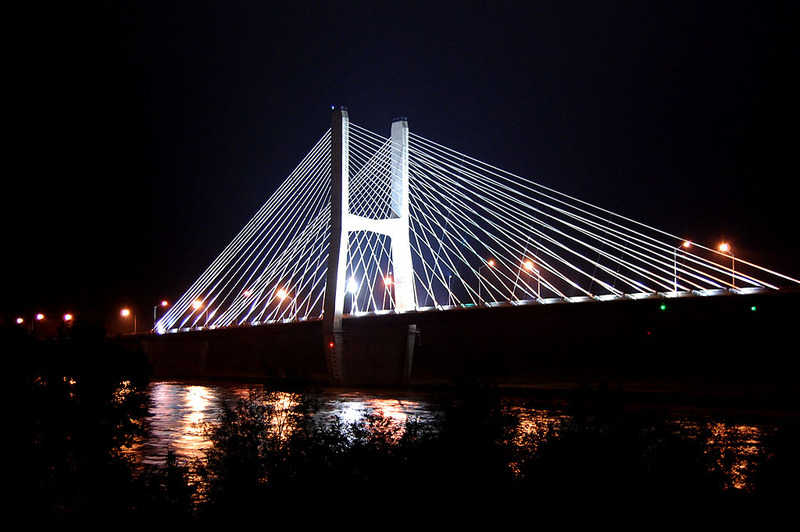 I am assisting a client in Cape Girardeau on obtaining an image of the Bill Emerson Memorial Bridge for use on the home page of their web site. I came across your photos and was wondering if any of them are available for use. If you could let me know, that would be great. Thank you so much. I’ll reply by email. I’m sure we can work something out.